Art and the Creative Life. 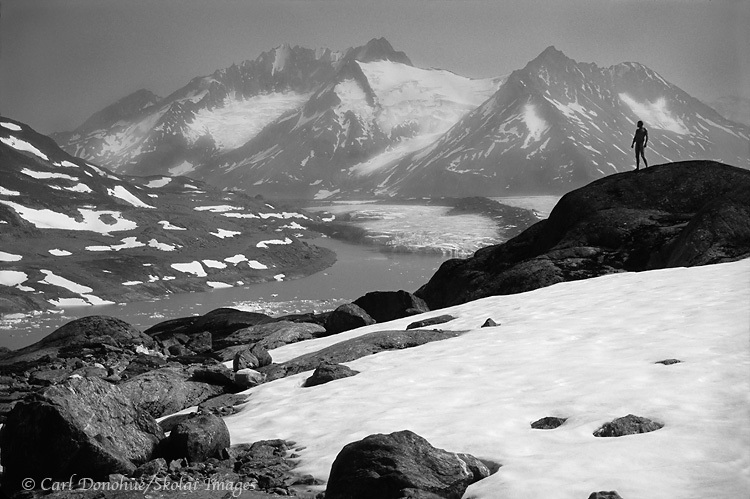 A backpacker stands, naked, in the Chugach Mountains, Wrangell - St. Elias National Park and Preserve, Alaska. Click the image to see a larger version. “It can be a difficult journey to live a creative life, if you live within an environment which does not understand or value creativity. Seek-out and surround yourself with positive soulmates”. I read this note on a Status Update on facebook a while back, posted by a great photographer from Australia, Steve Coleman. Steve posts consistently valuable stuff on his facebook page, and I try to read every one of his insights. It’s nice to see someone so giving of their talent. I’ve never met Steve, but looking over his website I can tell you I already know I like the guy; click on ‘Workshops‘. That page tells me all I need to know; what a wonderful perspective! The strength of the quote is in the paradox that it holds; creative work comes from within, yet what rises up from within is a function of the external. The input we open ourselves to form the outputs our work brings. But it’s more than that; I think a collective energy exists that is very real, very tangible, and we tap into that if we surround ourselves with a vibrant, creative community. Our neighbors, our friends, our peers, our families; these are all critical sources of creative energy that we draw upon, whether it be consciously or unconsciously. To create and bring to life an idea, your idea, is a terribly frightening process; it opens us to vulnerabilities few of us wish to expose. A ‘support group‘ is critical. I’ve been so fortunate most of my adult life to be surrounded by wonderfully creative, passionate, supportive and giving people. Almost too fortunate; at times I wonder why I’ve been given so much more from these people than I probably deserve. As a musician, some of my friends from as far back as my college days continue to be both inspirations and mentors; some of the musicians I played with, heard, saw, followed, admired and devotedly idolized provided me with opportunity, inspiration, knowledge and an understanding that the creative work is there for everyone to pursue. As a photographer, I was brought up in the realm of the internet. Photography forums and the people who make up those communities have played an incredibly prominent role in both my learning of the art and craft, and also the support to continue. The wealth of giving is an inspiration in itself. So, as the quote above instructs, surround yourself with artists, people who create. It’s a gift to your own art. This entry was posted in Adventures, Alaska, Backpacking and Hiking, Landscapes, Musings, Wrangell - St. Elias National Park and tagged Adventures, backpacking, black and white, Chugach mountains, Glaciers, hiking, Iceberg Lake, monochromes, outdoors, Wrangell - St. Elias National Park and Preserve, Wrangell St. Elias on December 1, 2010 by Carl D.
Just saw your ANWR spread on NatureScapes.net. Very nice, very nice, indeed. Words to live by there, as well.